Genetics is the science of heredity and variation in living organisms. Although the science of genetics began with the applied and theoretical work of Gregor Mendel in the mid-19th century, other theories of inheritance preceded Mendel. A popular theory during Mendel's time was the concept of blending inheritance: the idea that individuals inherit a smooth blend of traits from their parents. Mendel's work disproved this, showing that traits are composed of combinations of distinct genes rather than a continuous blend. Another theory that had some support at that time was the inheritance of acquired characteristics: the belief that individuals inherit traits strengthened by their parents. This theory (commonly associated with Jean-Baptiste Lamarck) is now known to be wrong—the experiences of individuals do not affect the genes they pass to their children. 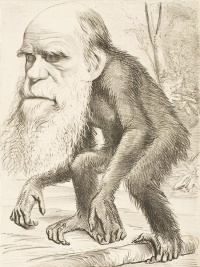 Other theories included the pangenesis of Charles Darwin (which had both acquired and inherited aspects) and Francis Galton's reformulation of pangenesis as both particulate and inherited. Although genes contain all the information an organism uses to function, the environment plays an important role in determining the ultimate phenotype—a phenomenon often referred to as "nature vs. nurture". The phenotype of an organism depends on the interaction of genetics with the environment. One example of this is the case of temperature-sensitive mutations. Often, a single amino acid change within the sequence of a protein does not change its behavior and interactions with other molecules, but it does destabilize the structure. In a high temperature environment, where molecules are moving more quickly and hitting each other, this results in the protein losing its structure and failing to function. In a low temperature environment, however, the protein's structure is stable and it functions normally. This type of mutation is visible in the coat coloration of Siamese cats, where a mutation in an enzyme responsible for pigment production causes it to destabilize and lose function at high temperatures. The protein remains functional in areas of skin that are colder—legs, ears, tail, and face—and so the cat has dark fur at its extremities. Environment also plays a dramatic role in effects of the human genetic disease phenylketonuria. The mutation that causes phenylketonuria disrupts the ability of the body to break down the amino acid phenylalanine, causing a toxic build-up of an intermediate molecule that, in turn, causes severe symptoms of progressive mental retardation and seizures. If someone with the phenylketonuria mutation follows a strict diet that avoids this amino acid, however, they remain normal and healthy. A popular method to determine how much role nature and nurture play is to study identical and fraternal twins or siblings of multiple birth. Because identical siblings come from the same zygote they are genetically the same. Fraternal siblings however are as different genetically from one another as normal siblings. By comparing how often the twin of a set has the same disorder between fraternal and identical twins, scientists can see whether there is more of a nature or nurture effect. One famous example of a multiple birth study includes the Genain quadruplets, who were identical quadruplets all diagnosed with schizophrenia. Unless indicated otherwise, the text in this article is either based on Wikipedia article "Genetics" or another language Wikipedia page thereof used under the terms of the GNU Free Documentation License; or on original research by Jahsonic and friends. See Art and Popular Culture's copyright notice. This page was last modified 20:48, 22 November 2013.